I paused briefly from my high-altitude plodding to take in the deep shades of gold and pink being cast over a panorama of snow covered peaks around us here in the heart of the Swiss Alps. Ahead of me and cutting the steps in the snow-covered ridge of the Monch were guides Kenton, Farmer and Margaret and following on the ropes were Nick, Owain, Becca, Montel and myself. Together we formed the heart and soul of the ‘Cool Climb team’ braving exposed ridges, corniced slopes and a hut full of snorers to attempt to climb the notorious Eiger to raise money and awareness for the charity Access Sport. The 4017m Monch was just one of our key objectives – an acclimatisation climb which would prepare our bodies for the duress of altitude which we would experience in the days ahead during our planned ascents of the Eiger and Jongfrau. It was a beautiful morning for our ascent of this majestic peak. We left the Mönchsjoch Hut at 3658m at 4am after feasting on a breakfast of muslix, cheese and strong ‘bowls’ of coffee and tea. The Monchsjoch hut is one of the highest huts owned by the Swiss Alpine Club. Because of its altitude, the first night in the Monchsjoch Hut, when the body is still adjusting to the ‘thin air’ will always present its challenges and few people manage a good first nights’ sleep at this altitude. Our merry band of travellers proved no exception with everyone appearing a bit more bleary-eyed than usual at breakfast. Only Owain, aka, ‘the Labrador’ seemed as spritely and keen as always and we had to hold him back from running out onto the mountain before breakfast..! webs and we began our silent approach over the glacier to the foot of the mountain where we strapped spikey-crampons to our boots, armed ourselves with ice-axes and donned our helmets! Nervous smiles were exchanged all around at the prospect ahead but we were comforted by our fearless guides who double checked our equipment to ensure that we were well prepared. Montell looked up excitedly and we all remarked how he would fare brilliantly on the ascent – particularly following his flawless (and seemingly effortless!) ascent of yesterday’s 2500m peak. Becca also smiled bravely, pacing on the glacier to keep warm and testing the knife-edged points of her crampons as we roped up and began the climb..! There’s a common distinction in climbing referred to as ‘Type 1 fun’ and ‘Type 2 fun’. Type 1 fun: This is when you enjoy the moment / activity as you are living it. That morning, under perfect conditions – mild temperatures, great snow, gentle slope, and a beautiful sunrise is a perfect example of ‘Type 1 fun’. Moving together as a team, sharing the occasional laugh and joke and experiencing the sheer beauty of the mountain under an exquisite sunrise – I found it difficult to imagine anything more perfect. I’ve spent a few seasons in the Himalaya so am accustomed to the challenges that mountain-terrain can sometimes throw at you – and how challenging it can be to overcome a fear of the unknown. 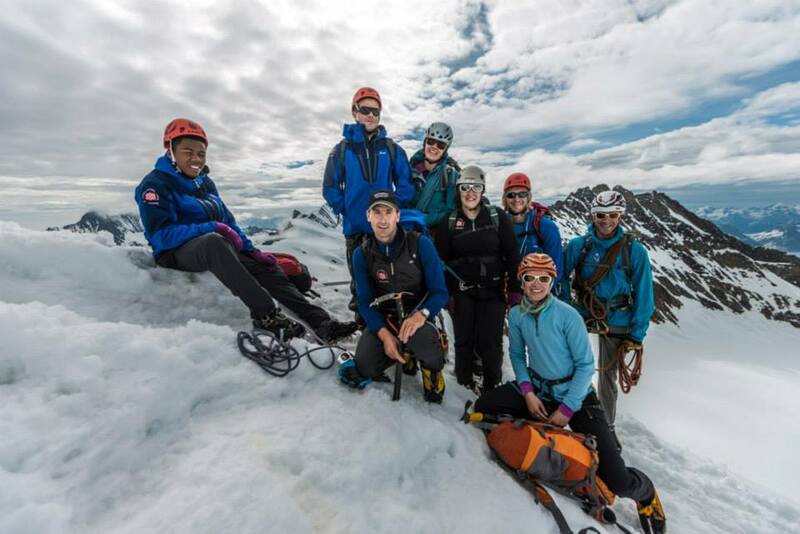 What most impressed me was the way that the team – particularly Montell and Becca – moved over the terrain especially given that they had never even walked on crampons before and, in Montell’s case, had never seen a mountain..! 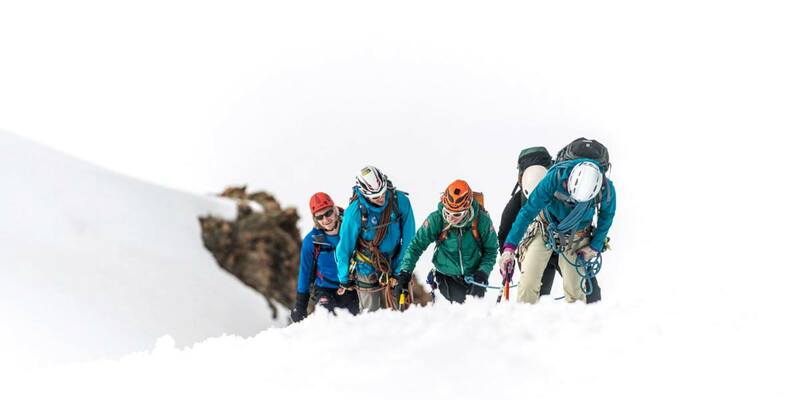 Rather than shy away from the challenge, they embraced it and excelled navigating over exposed rock, steep snow covered ridges, and dizzying heights. It was far from an easy, straightforward climb and yet they smiled through it and kept positive spirits throughout. Conditions began to deteriorate and the mild temperatures prompted a thick fog to roll in. 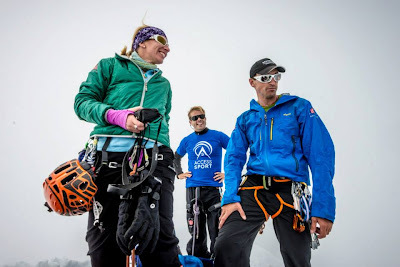 At around 3950m, on a particularly exposed ridge which presented perfect views of the sheer face of the Eiger Montell and Becca made the wise call to begin their descent. Given the warm temperatures there were additional risks posed by the melting snow and the descent often presents more challenges than an ascent – they showed tremendous maturity as budding climbers in understanding the conditions and their own abilities. 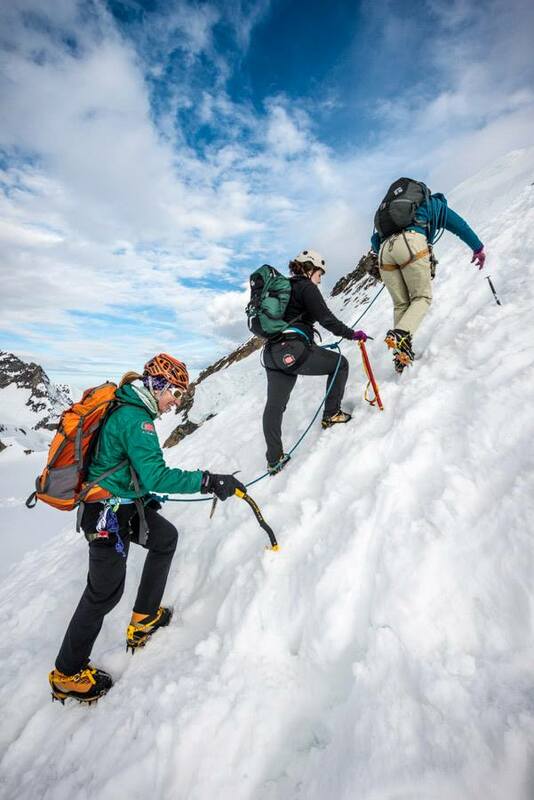 The expression, ‘everyone has their own Everest’ sprang to mind and I was / am absolutely thrilled to have the opportunity to share this Everest with Becca and Montell. We took advantage of a break in the fog to capture the moment with a well-placed team photo complete with an Access Sport t-shirt. Kenton, Farmer, Owain, Nick and I continued to the summit of the Monch while the visibility decreased due to the cloud which quickly began to close in. Every now and again there was a break in the cloud and we were able to witness the many snow covered peaks – the many ‘opportunities and possibilities’ below us. Enjoying these views was short-lived as the narrow summit-ridge was extremely exposed and attention was certainly required to put one careful foot in front of the other..! 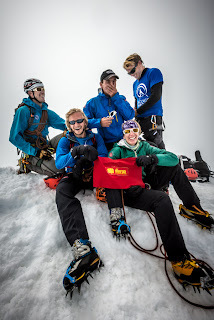 When the corniced, precarious summit finally came into view, the satisfaction of having realised our goal allowed us to take a few minutes to enjoy and congratulate each other on our collective achievement – the 4017m summit of the Monch! No matter the mountain, for me personally, ‘summit satisfaction’ feels the same – maybe a perfect example of ‘Type 2’ fun. There is a moment of happiness for having achieved the ultimate goal followed by an overwhelming with a sense of feeling incredibly ‘tiny’ and powerless in an environment which I feel hugely privileged to experience. The opportunity to experience this with such an exceptional team and for such a great cause made our success even sweeter. Something that I fully appreciated when we were all down from our adventure, safe and sound and enjoying a cold drink back in the hut..! Huge thanks to our fantastic Cool Climb Team for an exceptional day in the mountains and for yet another incredible alpine adventure..! and to Nick House, Owain Walbyoff, and Kenton Cool for their initiative in setting this up this fantastic opportunity for Access Sport..!